Sometimes one session just isn’t enough! Share this post of Facebook or Twitter. Check back to see who Nan’s winner is! 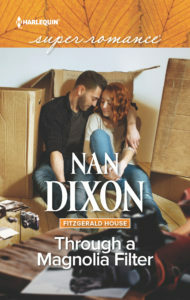 ~First things first, if you missed Nan Dixon’s first session you can take a quick look at it HERE. Me: Have there been any big changes in your life since our last session—good or bad? Tell us about them. Me: What a wonderful tradition! How did you know you wanted to be a writer? Nan: I always dreamed of being on the stage. ☺ But by the time I’d been in over 50 productions and was just coming out of high school; I’d burned out. And I wasn’t the writer in the family; my mother and one of my sisters were. But in high school we had to keep journals and my teacher complimented my writing. And in college, my freshman English teacher wanted me to publish a short creative writing piece I wrote about fairies. So the writing idea was always there. Even as captain of my university golf team, I wrote a Captain’s Log – modeled after Star Trek! (Golf date etc!) So the spark was there waiting to be feed some fuel. I finally began writing after my third child was born. Never did finish that middle grade book. But I did join my local RWA chapter for a time. Me: How do you deal with rejection or bad reviews? What advice can you give others about how to handle rejection and bad reviews? Nan: This is so apropos. I got a review last week that knocked me back—it wasn’t stellar, even though they still recommended the book. So I’m taking my own advice—take a few hours of grief time and then remind myself that writing is a very subjective art and if I can please 2 out of 3 people—I should be happy! Me: What’s the secret to your success? Nan: The secret isn’t really a secret. It’s knowing that success rarely comes immediately. You have to put in your 10,000 hours, get the rejection letters, enter contests and lose, and take the tough critiques to finally get published. Me: Nan–I love that answer. It feels so true to me. Tenacity is the key! What do you collect? Why? What personal meaning does this item have for you? Nan: Fun salt and pepper shakers! I can pick them up when I travel. They don’t take up much space in my suitcase, but I can remember the fun of the trip! Me: Tell me a little bit about your Contemporary Romance novel THROUGH A MAGNOLIA FILTER. Home is where his heart is…but what about hers? Family was always a foreign concept to Liam Delaney. Until research into one of his documentary films brings him to Savannah and Dolley Fitzgerald’s B and B. Dolley’s passion for life and photography is infectious. When she becomes his apprentice, they’re the perfect team in every way. He’s finally found the home he’s always wanted, and it’s all because of her. Me: Share your favorite paragraph with us. “You can’t work 24/7,” Dolley said. “You work every waking hour, don’t you?” she asked, appalled. “Oh, yes, I would.” She grinned. Dolley has dragged Liam to a Savannah pub. She’s extremely comfortable with people and groups, Liam would rather see the world behind the camera. Her goal during this scene is to get Liam to smile 5 times. It was fun seeing if I could get the hero to smile when he uncomfortable and out of his element. Since Liam has technical skills he’s teaching Dolley, I thought it would be nice to have something that Dolley could teach him so their power wasn’t so lopsided. 30% OFF all three FITZERALD HOUSE series novels! Enter the coupon code FITZND30 when you check out! Abbie Roads writes dark emotional novels featuring damaged characters, but always gives her hero and heroine a happy ending… after torturing them for three hundred pages. 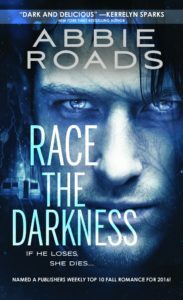 Her first novel RACE THE DARKNESS is available for pre-order now! 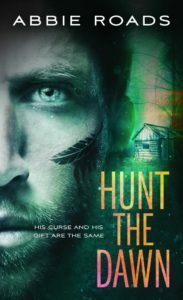 Check out Abbie Road’s second Novel HUNT THE DAWN, which is also available for pre-order! I couldn’t agree more with your secret–tenacity is the way to go! BTW, this is such a great column–I learned a lot about you–and discovered you’re a really interesting person! Thanks for stopping in Erika, and thanks for the kind words! Abbie column is pretty cool! I think all the Dreamweavers LIVE this secret! Nan, I have LOVED these books! Love the collecting salt & pepper shakers, I collect too many things, Snow White memorabilia, butterflies, angels, mugs, strawberries, I have a collectible plate collection, but no place to put them! Also, I have enjoyed seeing pics of the grandbabies, family is everything. Looking forward to reading Liam and Dtollie’s story, and really looking forward to Mate and Cheryl’s story, That’s the one I’m waiting on!!! Ooh Pamela, you are making my day! Thank you for stopping by! I love the sound of all your collectibles! The space to put things is a problem–isn’t it. Family is everything! 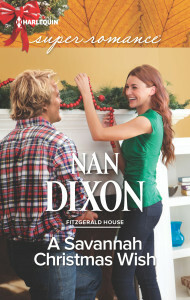 I’m having fun with Nathan and Cheryl’s story – and the 5th book I will redeem Gray’s sister Courtney! That’s been fun! I wish the 10,000 hours wasn’t true – but it sure seems to be the case. Thank you for swinging over, McCall! Yes – but Shelly, your teapots are so, so special. I did bring back a gorgeous teapot from St Petersburg Russia when my daughter was dancing and training there. And I didn’t break it!! Thanks for stopping over! Shoes count! My kids are appalled at how long I keep my shoes for! Thanks for stopping in! Totally agree tenacity is the key. 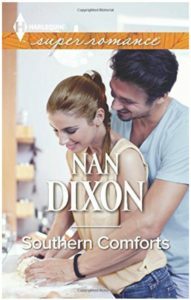 Love the excerpt, Nan! Thanks for stopping over Laura – I have a few dust bunnies too! Sigh…. Hi, Nan. I enjoyed your interview. I have a salt and pepper collection, too! Only I don’t collect them. I’m stuffed to the gills with them, even after doing a major downsize. I don’t accept them as gifts. But I just can’t stop myself buying them when they’re too cute not to! My fav set: the sailor and nurse kissing like the iconic photo. 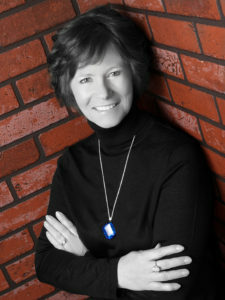 Sheri – thanks for stopping in! I love the sound of your sailor and nurse. So cool. I have my mom’s raggedy Anne and a teddy bear that I always pull out at Christmas. But I love the one’s with magnets that hook together. Thanks for returning for 2nd session on my couch! Thanks for having me on the couch, Abbie! It’s always fun! Loved the excerpt, Nan. The idea of teaching a workaholic man to have fun sounds like… well, fun! Congratulations on your new granddaughter. It was kind of fun teaching him how to have fun! And the new grandbaby is so cuddly! And now Fluffy Top is going to have a brother or sister! I am blessed!